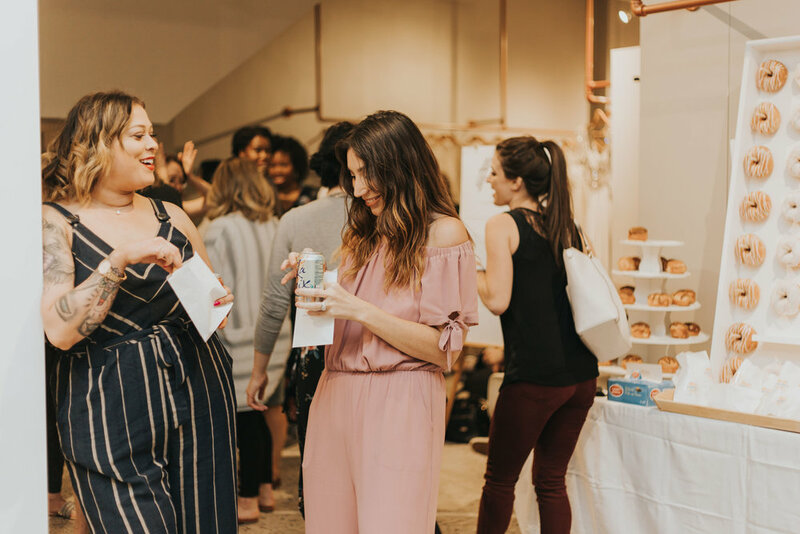 At the end of August, we got to celebrate four years of business in Minneapolis with a huge bash and brand launch by local designer Tara LaTour, Rose+Williams. 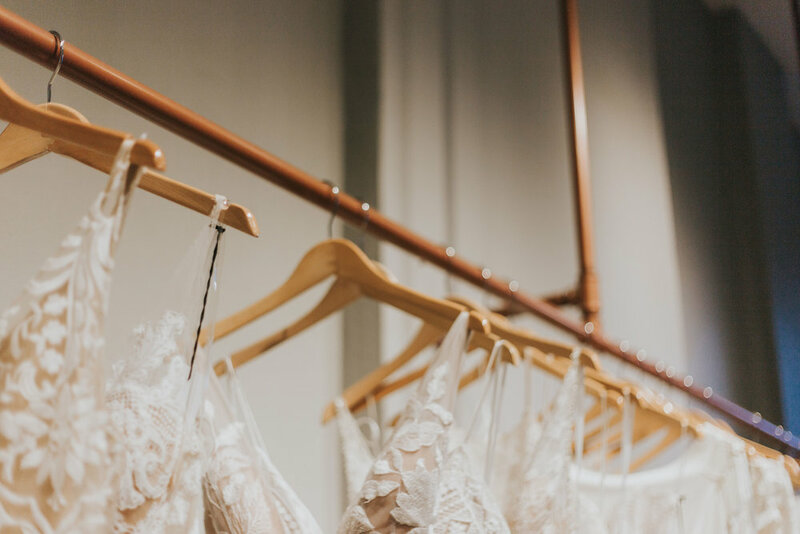 We invited brides old and new, our local community of creatives, friends, and family to preview the collection before anyone else! 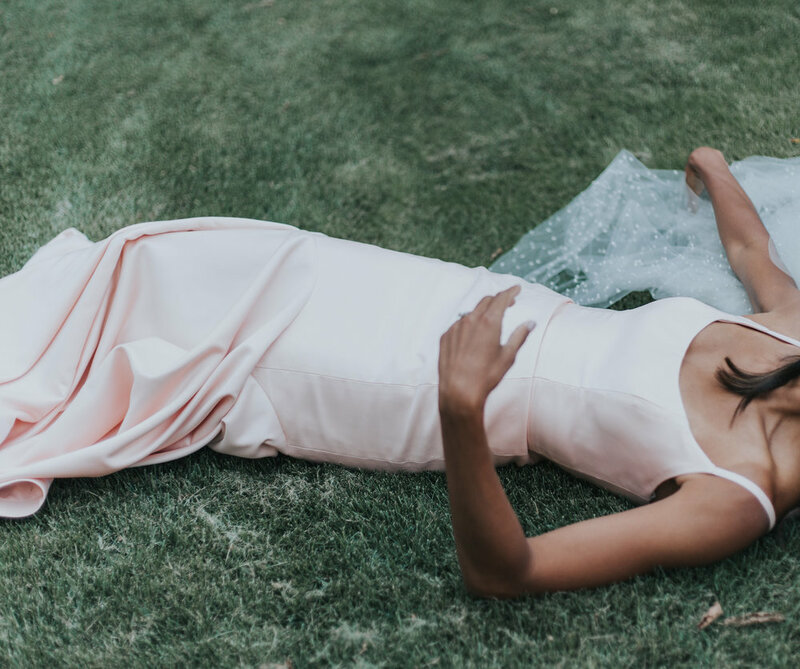 Tara was in attendance and our brides were gushing over her impeccable construction and stunning fabrics. 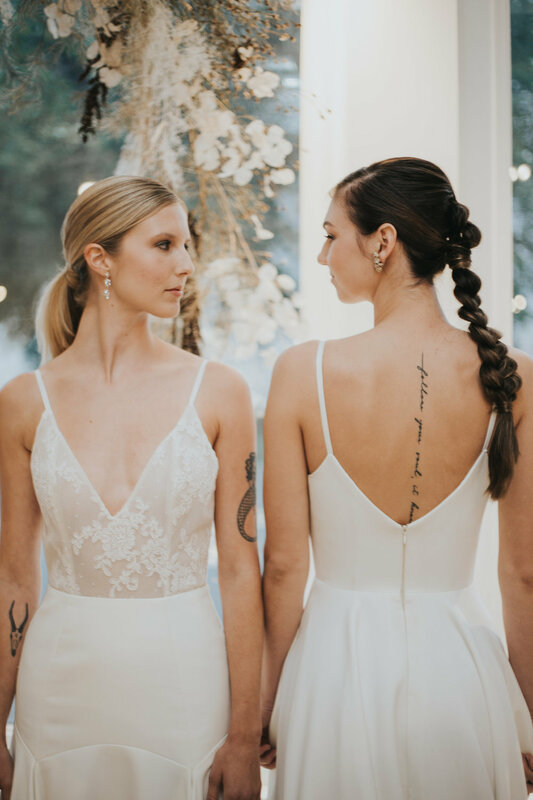 It's safe to say our community of brides is behind this brand and so excited to be able to wear a local designer on their wedding day! We were able to collaborate with one of our favorite duos, Emma and Alexia of Kindred Blooms, on decor for our soiree. The team was in our shop all day creating whimsical, modern installations that perfectly complemented Tara's sleek designs. We love out of the box creations, and the Kindred girls always nail our vision to perfection. It wouldn't be a true a&bé Minneapolis party without our favorite sweet treat. We got seriously hooked up by Tara's wonderfully talented neighbor, Mike, who just happens to own the best bakery this side of the Mississippi. Valley Pastries graced us with a wall of their scrumptious donuts, and people have not stopped talking about them to this day. To keep the sugar high going we also had brand spanking new Forward Bakery in the house providing the airiest macarons. Owner Hannah even created a custom Rose + Champagne flavor in honor of Rose + Williams! The gold leaf detailing made our hearts flutter. The room was buzzing with anticipation as Tara gave the guests a background of how the collection came to fruition. The moment the models began walking out in the new collection the room was giddy. 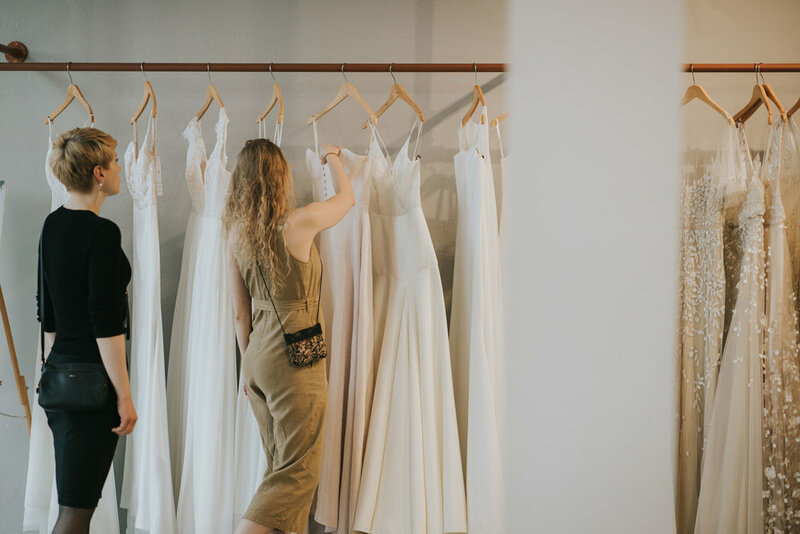 Every model was fitted in the most perfect dress for her, and the confidence we saw as the fabrics flounced around the shop was inspiring. Every bride in the room wanted to be a Rose+Williams bride at that moment. We capped off the night with the most exciting part of the party, our giveaways! We had three lucky winners and each of them was over the moon to have been selected to win an essential element of their big day! One lucky gal won an Untamed Petals Rain Headvine, our current favorite opal accessory. Another won over $1000 off a wedding day photography package from local maker Katie Kopan. Our last winner won $2000 off her Rose+Williams gown! There were many happy tears, a lot of hugging, and a huge celebration of support when her name was called. 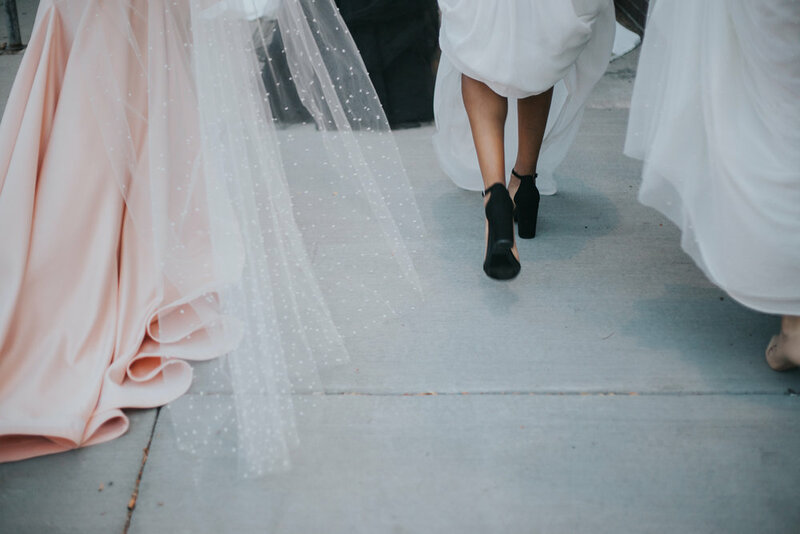 These events make us so happy we chose to call Minneapolis home, and we couldn't have pulled it off without the support and talents of Katie Kopan Photography, Kindred Blooms, Valley Pastries, Forward Bakery, Lady Vamp Artistry, Untamed Petals, and of course Tara La Tour.